When your next concrete polishing job can benefit from a wet polishing method, consider the CRMX 3-Step Polishing System. 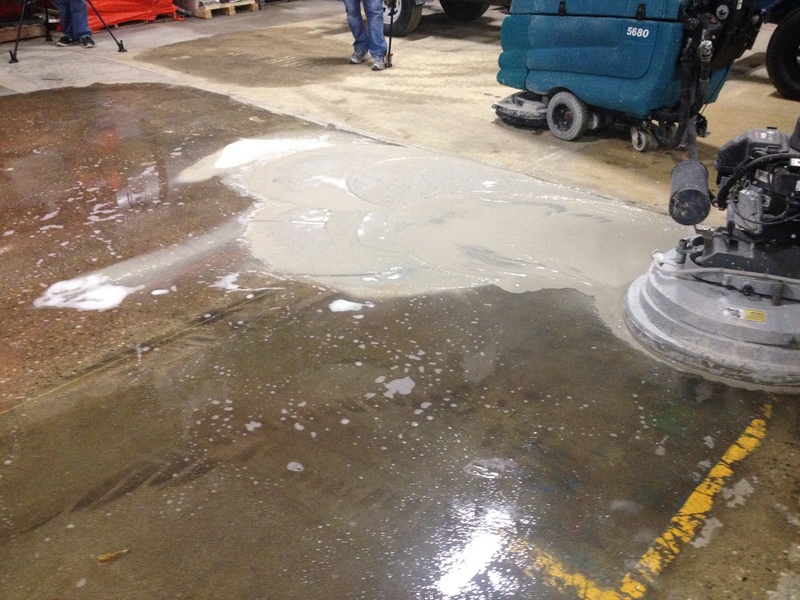 During concrete polishing jobs, contractors can opt to use both processes for different stages of grinding. Dry polishing can be used for the initial phase, to remove the most concrete. To achieve the smoother stages of polishing, crews can shift to the wet polishing process. Floor Preparation – move directly to Step 1 after floor prep unless a PCD tool is used. Then follow floor prep with the appropriate metal bond tool to mitigate the scratches before proceeding to Step 1. Chemical Component: Uses with tools in both Step 1 and Step 2, the CRMX Surface Refining Agent helps in removing scratches quickly, eliminating the need for lengthy grinding steps to achieve high levels of clarity. Tooling Component: Made from natural earth materials, the 5-Segment Canvas “Refinement” Tool will not transfer spent resins in the concrete surface that cause contaminated finishes and provides a scratch-free surface that can be sealed as is. For a higher refinement, continue to Step 3. Chemical Component: The CRMX Densifier hardens and increases density in one, ready-to-use formula, dust-proofing concrete with nano-sized particles. Once properly applied, the densifier significantly improves the durability of the surface, resisting moisture and topical water spills. The densified floor has to be completely dry before proceeding with the polishing tool. Tooling Component: Developed to produce the cleanest finishes in the industry, the 3-inch Canvas “Polishing” Tool is constructed with the highest grade epoxy resins available, producing average gloss ratings of 70 and frequencies in the single digits. Chemical Component: The CRMX Acid Blocker is formulated to perform in high pH environments and high traffic settings such as retail groceries, commercial facilities and industrial floors, rendering a high performance, ultra-hard, water tight, dust-repellant surface that is resistant to chemicals and acid staining. It provides a 60% increase in light reflectivity from untreated concrete surfaces without decreasing the coefficient of friction on surfaces. Burnish with a non-diamond high speed burnishing pad after the chemical has completely dried. A growing trend in versatile, beautiful flooring solutions that can also last a lifetime is the use of polished concrete. To attain such visual aesthetics, contractors first look at the concrete itself. There’s a time-honored adage about concrete, whether processed or not, that it is consistently inconsistent. Every single pour will be different from the next, with variations in color, cracking and overall flatness. However, the general goal is for the floor’s flatness to be as even as possible while pouring a new slab, as well as preparing the surface of an existing slab for finishing. This being said, when pouring a new concrete floor, it’s a good idea to look at a polished finish as part of a total flooring system that includes 1) a concrete mix design, 2) curing, 3) a finishing method and 4) the actual polishing process. A concrete slab that’s poured with the polishing process in mind will greatly enhance the end result. Working with existing concrete slabs, results are determined by the quality of the existing concrete. Color variations, contaminates, cracks, patterns left by previous floor covering, stains, nail holes, patched areas and flatness all affect the newly polished appearance. 1. Cream Polished or Surface Cream: the top layer of the concrete is made from troweled cement paste that contains the cement fines of the mix. Only 1/32 – 1/64-inch is removed from the slab surface, resulting in little or no aggregate exposure. This is a popular, economical style; the cream is the purest, most consistent in color, has the fewest imperfections and can be stained any color. 2. Salt and Pepper: the layer just below the cream made from fine aggregate – sand and very small stone that gives the concrete a “salt and pepper” look. To achieve this look, 1/64 – 1/8-inch of the cream is removed by grinding the surface, exposing small amounts of medium aggregate randomly throughout. The ideal time to start the grinding process is within 7 days of pouring the concrete slab, which helps to expose just the right amount of aggregate. 3. Exposed Aggregate: the layer below the cream and salt and pepper made from coarse aggregate within the concrete mix. To reach this layer, 1/8 – 1/4 -inch is ground from the surface, removing the top two layers. This process should start almost immediately after a concrete slab has been poured to within 3 days of pouring to achieve the aggregate exposure desired. Course aggregate comes in three sizes: small, medium and large. After achieving the type of aggregate exposure, the concrete is polished to a desired clarity of reflection. 1) ground to a flat shine, 2) honed to refined even appearance, 3) semi-polished, for crisp, smooth look or 4) highly polished, for a mirror effect.